Through low-budget carrier Citilink Indonesia, which is a subsidiary of Garuda Indonesia, the latter is set to acquire operations of Sriwijaya Air through a joint operation (JO) scheme. It is a big move that drastically decreases the leading position of the Lion Air Group in Indonesia's domestic aviation market. If we take a look at conditions in Indonesia's domestic aviation market in full-year 2017, then private airline Lion Air (which recently and tragically lost an airplane) controls a 34 percent market share in terms of domestic air passengers. That year, Lion Air transported 33.1 million people on domestic flights. If we add its units Batik Air and Wings Abadi (Wings Air), then the Lion Air Group controlled 50 percent of Indonesia's domestic aviation market in 2017. However, the latest acquisition will bring the Garuda Group's market share near that of the Lion Group. In 2017, Garuda Indonesia controlled 20 percent of the domestic aviation market, while its subsidiary Citilink Indonesia controlled 13 percent. Synergy between the Garuda Indonesia Group and Sriwijaya Group will add 10 percent through Sriwijaya Air and 3 percent through NAM Air (see the table below). Hence, the Garuda Indonesia Group's market share in the domestic aviation market is set to rise to 46 percent. As such, the Lion Group and Garuda Indonesia Group are expected to become engaged in an increasingly fierce battle for control of the domestic industry. I Gusti Ngurah Askhara Danadiputra, President Director of Garuda Indonesia, is optimistic that the strategic move will boost synergy between the Garuda Indonesia Group and Sriwijaya Group so that the combined domestic market share can reach - and remain - at around 51 percent. The takeover of operational control has various positive effects on Garuda Indonesia's operational side in terms of capacity, flight network, capability, and efficiency but will also enable the Sriwijaya Group to settle part of its debt (for example debt it owes to Garuda Indonesia's subsidiary Garuda Maintenance Facility AeroAsia and state-controlled financial institution Bank Negara Indonesia). Although Garuda Indonesia recorded net losses over 2017 and the first three quarters of 2018, the JO scheme is not expected to add a significant financial burden on Garuda Indonesia. In fact, the group will obtain certainty that Sriwijaya's debt to Garuda Maintenance Facility AeroAsia will be settled. 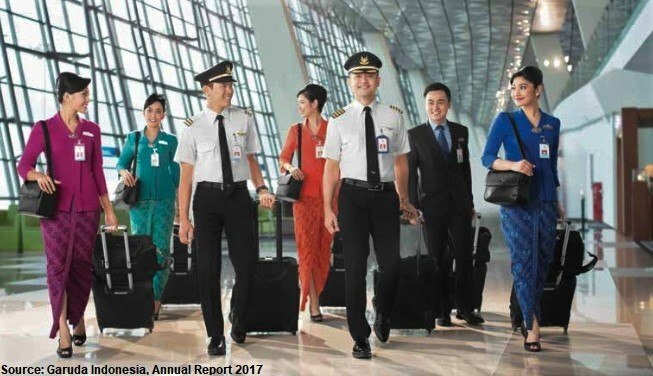 At the end of September 2018 Garuda Indonesia reported a USD $114.1 million net loss. On the positive side, its net loss eased by 48.6 percent compared to the same period one year earlier. The airline recorded revenue of USD $3.2 billion up to the end of September 2018, up 3.22 percent (y/y). Meanwhile, Chandra Lie, President Director of Sriwijaya Air, said the JO scheme will help to improve Sriwijaya's business amid increasingly fierce competition in the nation's aviation market. On Thursday's trading day (15/11), shares of Garuda Indonesia, listed on the Indonesia Stock Exchange, had soared 23.0 percent to IDR 246 a piece by 14:45 pm local Jakarta time on the back of the deal.